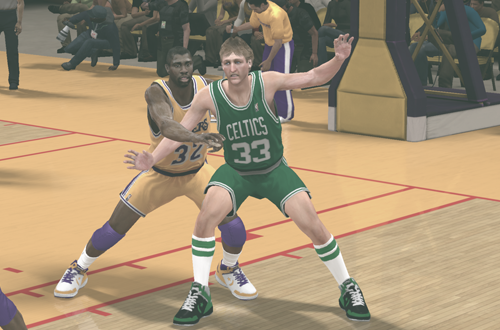 With the success of the Jordan Challenge in NBA 2K11, and a lockout looming over the 2012 season, Visual Concepts doubled down on historical content in NBA 2K12 with NBA’s Greatest. Whereas the Jordan Challenge had been centred on Michael Jordan – obviously – NBA’s Greatest not only spotlighted MJ, but fourteen other NBA Legends: Magic Johnson, Larry Bird, Julius Erving, Kareem Abdul-Jabbar, Wilt Chamberlain, Bill Russell, Oscar Robertson, Hakeem Olajuwon, Karl Malone, Patrick Ewing, Scottie Pippen, Jerry West, and John Stockton. Unlike the Jordan Challenge, which represented specific games and challenged gamers to match MJ’s statistical marks, the games in NBA’s Greatest were simply match-ups between one of the Legends’ squads, and a historically significant opponent from the same season. The only objective was to win the game with the Legend’s team, in the process unlocking both squads for use in exhibition play. While this change came as a disappointment in some respects, it did make the challenges more straightforward, and the games themselves were still fun. Quarter length could also be changed, after being locked to eight minutes in the Jordan Challenge. While the Jordan Challenge included all of the most significant players on its historical teams, more than a couple of teams were heavy on fictional placeholder players. 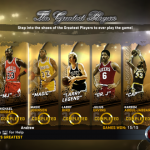 For NBA’s Greatest, Visual Concepts managed to get at least eight real players on each squad, though placeholder players still rounded out all of the teams. The more authentic rosters unquestionably added to the experience, and facilitated modding projects, notably the original Ultimate Base Roster. Charles Barkley was (unsurprisingly) the only big name who wasn’t included; as a result, he’s missing from the ’85 Philadelphia 76ers, and Jordan’s challenge instead pits the ’93 Chicago Bulls against the ’93 Charlotte Hornets. While the games were fun to play, the lasting legacy of NBA’s Greatest has to be what it managed to achieve in terms of its presentation, which was just spectacular. 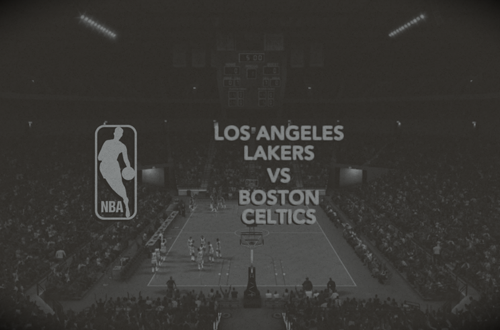 Each game featured presentation that was styled after an NBA television broadcast of its era. This not only included the overlays, but also visual and audio effects. The earliest game – Bill Russell’s challenge set in the 1965 season – is in black and white. 70s and 80s games have washed out colours and a fuzzier picture, with the mid to late 90s games looking much better. If you go back and watch real games from those eras, you’ll see how accurate the visual effects and overlays are, minus network branding. In terms of the commentary, NBA’s Greatest is presented as Kevin Harlan, Clark Kellogg, and Steve Kerr commentating on an old game from the archives. This is an excellent way of handling the situation: not only does it preserve a sense of historical accuracy, but also realism, as Steve Kerr himself is an active participant in some of the games. It also allows the trio to mention trivia and comment on the players’ overall careers, so it’s a nice history lesson as you play. From the moment it was announced, I felt that retrospective commentary was the right approach, and it worked out really well. 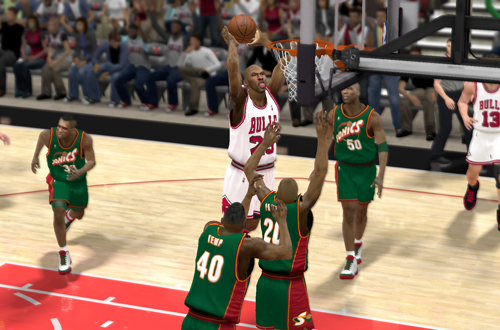 Dusting off NBA 2K11 and NBA 2K12 over the weekend, I did struggle a little at first. It’s been some time since I played either game regularly, so it took me a while to reacquaint myself with the controls, which have changed significantly in recent years. I realise this may be a controversial opinion, because we’re talking about two great games that are still many people’s favourites, but I feel that NBA 2K11 and NBA 2K12 really don’t hold up that well in that regard, with some clunky controls and player movement. Shooting mechanics have also gotten a lot better since then. That being said, after playing a few games of NBA 2K12 and running through the Training Camp tutorials again, I did get a better handle on the controls. While I still don’t like them as much as the Pro Stick and other controls in recent games, I did find myself getting used to them again, and playing much better as a result. The first couple of games I played were Patrick Ewing and Hakeem Olajuwon’s challenges, and without a good handle on the controls, they certainly were challenging. However, once I was more comfortable with them, I won most of the games more handily, only having to repeat Jerry West’s challenge. Those ’71 Atlanta Hawks put up a good fight! It was certainly interesting to go back and play with those teams from the 70s, when there was no three-point line. You don’t realise how much you miss having that weapon in your arsenal until it’s gone. A couple of quick threes can build a lead or erase a deficit in short order, so without the arc, you’ve got to work harder to put points up on the board, while also really knuckling down on defense. I did find myself making some shots from what would have been three-point range, and indeed, hit a shot after the buzzer with Jerry West that would’ve forced overtime, had it come in time and the three-point line been in effect. It was a tough way to lose. Simply put, NBA’s Greatest is one of the best modes we’ve seen in a basketball game, and just what NBA 2K12 needed to deliver some fresh content while we waited for the lockout of 2011 to be resolved. I do have to say that in going back to NBA 2K12 over the weekend, I now have a greater appreciation for some of the significant improvements that have been made in recent releases. If nothing else, I prefer right stick dribbling controls, so NBA 2K12 isn’t a game I’m likely to revisit too often. However, I’m glad I went back and took care of some unfinished business with NBA’s Greatest. It’s a mode that’s definitely worth completing, and fondly looking back on. Great read. I loved that mode. Hopefully 2K brings it back one day. Glad you enjoyed it! Absolutely agree. It’s great that they’ve added some more historical teams in subsequent years, and they are fun to play with, but some sort of challenge mode would give us extra incentive to do something with them.